In a scene reminiscent of a seventeenth-century Dutch still-life painting, the actors in Mary Lucier’s video Still Life #1 arrange a sumptuous feast on the long table in this all-purpose room, in which the family cooked, ate, and gathered. 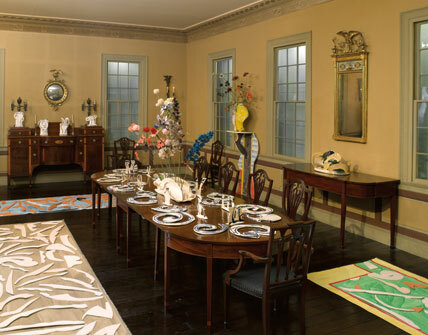 Playing House is the first in a series of installations that aim to engage visitors with the Brooklyn Museum’s period rooms. 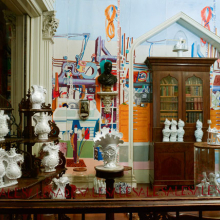 Artists Betty Woodman, Anne Chu, Ann Agee, and Mary Lucier have been invited to place site-specific artwork in eight of the Museum’s historic rooms, which have been interpreted by curators over the years to illustrate how Americans of various times, economic levels, and locations lived. The artists were asked to consider these factors when developing their ideas. The project originated with Woodman’s observation that although being an artist means confronting the art of the past, no one can enter the past—except through “make believe,” or “playing house,” by which the past can be appropriated. Chu created magical birds and flowers out of textiles, feathers, paper, and metal, unexpectedly bringing nature and the outside world into the rooms. Lucier, who is descended from Dutch and Huguenot settlers, created videos that evoke memories of place and where we come from. 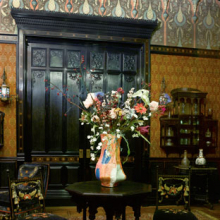 Agee transformed the strict social order and luxury of the Milligan rooms into an artisan’s workshop, and Woodman created table settings and “carpets” incorporating painting and ceramics. 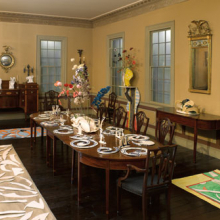 Playing House occupies the Cupola House Dining Room, the Russell Parlor, the Cane Acres Plantation Dining Room, the Worsham-Rockefeller Moorish Smoking Room, the Schenck Houses, the Weil-Worgelt Study, and the Milligan Parlor and Library. The installation is organized by Barry R. Harwood, Curator of Decorative Arts, and Eugenie Tsai, John and Barbara Vogelstein Curator of Contemporary Art, Brooklyn Museum.